Chief executives from leading European broadband infrastructure operators, and private equity investors are meeting to discuss opportunities for expansion on a dedicated panel hosted by leading international law firm Ashurst at TMT Finance World Congress 2017 in London later this month. Martin Lippert, CEO of Broadnet; Thomas Railhac, Partner, Cinven; Dana Tobak, CEO of Hyperoptic; Patrick Farajian, CEO and Chairman at Sodetel and Per Helge Svensson, CEO of Tampnet Group will discuss opportunities for new investment and assess how the market is developing in Europe and globally. “The growth in the digital economy is pushing up demand from businesses and consumers for high-speed data services. This is leading to a slew of businesses addressing that demand and, in turn, boosting confidence that investors in such projects will see returns,” said Nick Elverston, head of the TMT and Digital Economy Group at Ashurst, who will be hosting the panel. “Historically, in the domain of telcos (such as BT and Virgin Media), we are increasingly seeing infrastructure funds and others looking for the right opportunities to invest in newer operators (such as Hyperoptic, Gigaclear and TrueSpeed in fibre to the home area and CityFibre in the backbone). Whether the investment, and government subsidies, will be sufficient to deliver the smart cities of the future remains a big question,” he added. 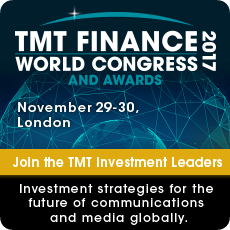 The panel discussion, which is one of 30 dedicated sessions on Telecom, Media and Tech M&A at this year’s expanded TMT Finance World Congress 2017, will address areas such as build vs buy opportunities, the role and changing business models of fibre network operators, M&A and Financing, and the role of private equity and infrastructure funds. Broadband Investment has been a defining theme in TMT strategy and deal making in 2017, with 2018 tipped to see even more activity in Europe and globally. Reflecting this in the programme, an additional Breakout Session on Broadband Investment will be held earlier in the day and includes Matthew Hare, CEO, Gigaclear; Benoit Denis, Project Directorate, European Investment Bank; Alex Goldblum, CEO, Eurofiber; and Carl Sjölund, Director, EQT. TMT Finance World Congress 2017 gathers Telecom, Media and Tech industry leaders with Investment Bankers, Private Equity Investors and Professional Advisers to assess the latest opportunities for expansion. For more information, go to http://www.tmtfinance.com/world.